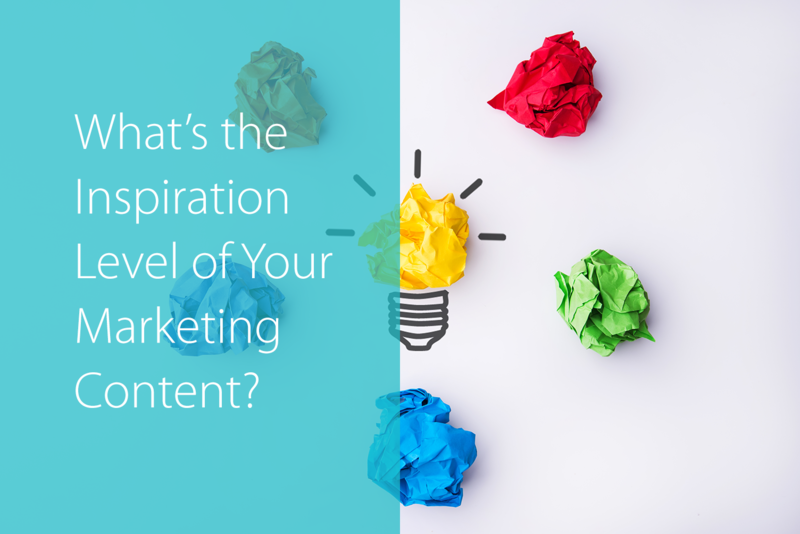 What’s the Inspiration Level of Your Marketing Content? Why do some pieces of content go viral while others are swept under the rug? There’s no one formula for inspirational content, but there are five essential components to address when creating marketing materials that capture your audience’s attention and interest. 1. Will my audience care? You aren’t creating content for yourself. You’re creating it for your audience. When you go to share an article, tweet, write a blog, or send out an email, ask yourself, “will my audience care?” Just because you find something interesting doesn’t mean your target clientele will. Consider what your John Doe likes and is interested in learning about. Does your content offer useful or interesting information that will resonate with them? Or will your content only be interesting to people that care as much about insurance as you do? 2. Will my content reach them? Where is your audience? If you’re targeting millennials, they’re likely on social media or asking questions on a search engine. If you’re after business professionals, there’s a good chance LinkedIn and email are their main methods of communication and learning. An inspirational and effective piece of content is one that can be quickly and easily found by your audience. Think carefully about where your audience is and do your best to meet them on their own turf. 3. Does it align with my goals? As much as marketing is about creativity, it’s also about analytics. You should have a specific goal for each strategy you implement. With a goal in mind, you can benchmark your progress and take note of what content is working and what isn’t. Over time, you’ll get better and better at engaging with your audience and inspiring them to take action with you. 4. Is this an original concept? First, we understand that just about everything has been done before, whether it’s a list of the most expensive insurance claims or the top five reasons your business has been audited. However, there is always a way to put an original spin on a conventional idea. Use your unique voice and experiences to share a story or share the idea in a new or exciting way. 5. Does this fit my brand? Not everything works for everyone. Just because a business’ Facebook post went viral doesn’t mean the same post will have the same results on your Facebook page. Don’t fall prey to gimmicks and always keep your brand top of mind. By staying consistent with your business’ brand, your audience will start to remember your business and know exactly who you are and what you offer. When attempting a new marketing method, writing a blog article, or launching a campaign, consider these five questions to help guide you in the creation and dissemination. The more strategic you are, the better the results!